When You are Falsely Accused, Who is the Real Criminal or Victim? But this Proverb is a solemn warning to us to be careful to listen to both sides of an issue before making a judgment. More importantly, it requires that the one who is accused must have the opportunity to face and to cross-examine his accuser. This is and has been a crucial underpinning of our system of justice for centuries. Regrettably, in the current emotionally charged climate surrounding many accusations in our current culture, this foundational principle of American jurisprudence is being abandoned by many. This is a shame, but it is also a dangerous thing; because to jettison due process and fundamental fairness is to put each and every one of us at risk. 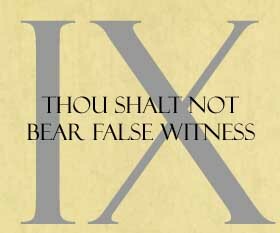 Not only is “thou shalt not bear false witness” one of the Ten Commandments that Moses holds in his hand atop the U.S. Supreme Court building, but it is also one of the firmest props of our Common Law legal system in America, a system which is based on and wholly influenced by God’s Law. Now I am sure that most of you reading have been falsely accused — OR perhaps you have been accused of something that you not only didnotdo, but that you would not do and consider to be horrible and heinous? Well, it happens more often than you might think. It is a dreadful experience. Frequently inmytravels I have been on the receiving end of many false accusations and if this has happened to you, then I don’t have to tell you that the pain never totally goes away. Regrettably, we are now living through a season of screeching, politically charged accusations demanding justice for the victims of abuse. And if the accusations are true, then punishment is well-deserved, so healing can take place. But the law requires us to “inquire diligently.” For if these very serious accusations are false, then the accuser is the criminal, and the accused is the actual victim.